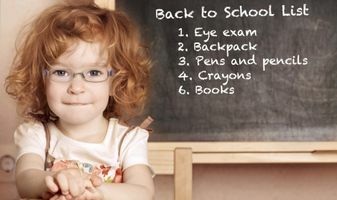 Why a comprehensive eye examination should top the back-to-school checklist. Vision plays a critical role in learning. In fact, eighty percent of learning is done visually, and one in four children have an undetected vision condition. Children often do not know what good vision is if he or she has never experienced it, so he or she will not voice that there is a problem and often leads to frustrated students or low self esteem. It is common for vision problems to be mistaken for a learning disability. Because eye health and vision development plays a major role in academic growth, an eye examination is a great investment in your child's education. Is there a difference between a comprehensive eye examination with us versus a vision screening at school or by the pediatrician? Yes. While screenings are valuable and do help identify some eye or vision problems, they are not a substitute for a comprehensive eye examination. A comprehensive eye examination includes visual acuity, cover test, pupil assessment, extraocular muscle evaluation, visual field testing, retinoscopy, anterior slit lamp examination, and dilated posterior slit lamp and binocular indirect ophthalmoscopy examination. By contrast, a vision screening usually consists of visual acuity only. How often should a child have his or her eyes examined? Annually. Eye health is an important part of your child's overall health care. Whether you have vision insurance or not, the majority of medical insurance plans cover an annual preventative eye examination for children. We accept most medical insurance plans for preventative or medical eye examinations. We strongly encourage you to schedule a comprehensive eye examination before your child starts school again to help ensure he or she is ready and eager to learn. That's good to know that a child should have an eye exam annually. My son hasn't had an eye exam in years. I'll have to get him one before he starts school and find an optometrist who can do it. Yes, it's a great idea to have your son's eyes examined before school starts. We see pediatrics here. Just let us know if you would like to schedule him an appointment. Thanks for explaining why it's good to have an eye examine before going back to school. It's nice to know that this examination should happen every year. It sounds good to schedule it in the summer so that the child can return to school with new glasses depending on how their eyes have developed.